Morning! Today I wanted to share with a space I just finished for an e-design client. It was so much fun to work on, and while the homeowner is still working on pulling the space together, I think the direction she's headed is going to be darling! 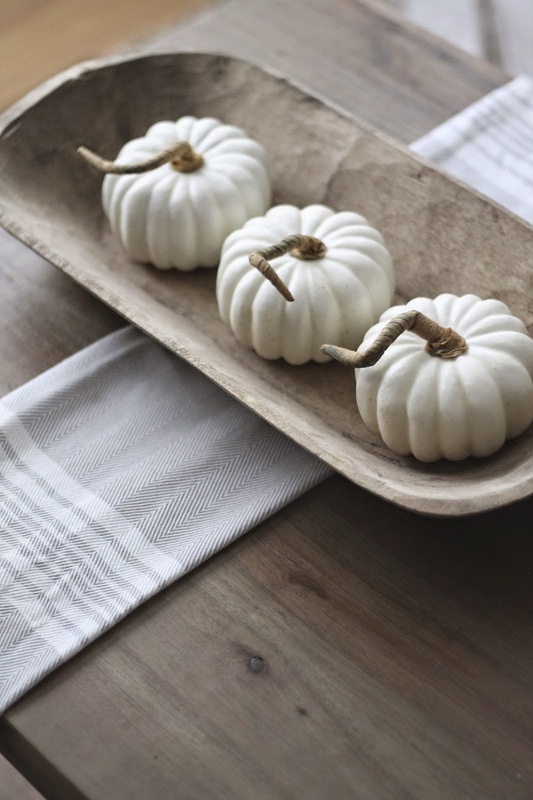 But first I wanted to say thank you to Kim from the beautiful blog Savvy Southern Style for allowing me to guest post on her blog last Friday! 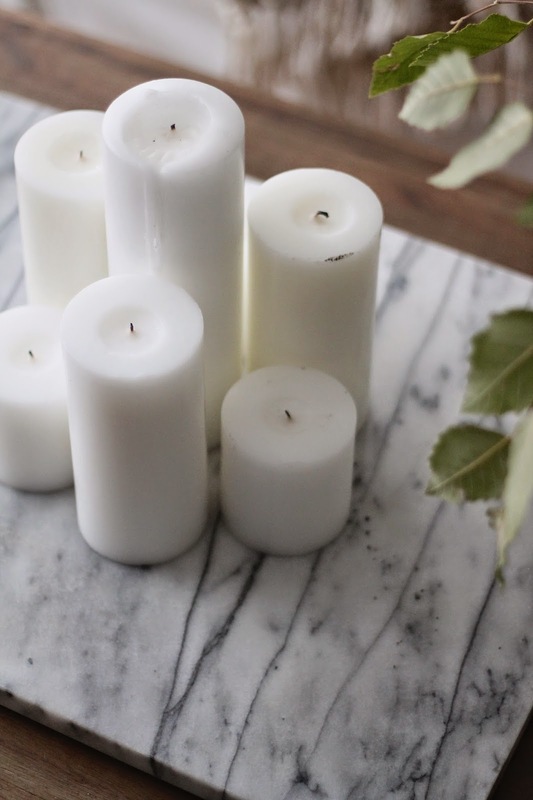 I got to share all about my favorite room and it was such an honor to be featured on such a gorgeous blog! Welcome to anyone coming over from SSS – I'm so glad to have you here! 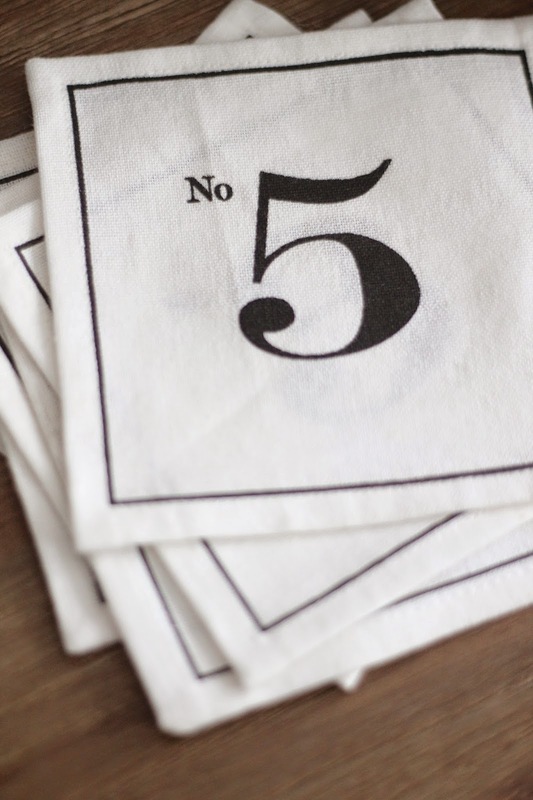 In case you missed it you can go here to read all about my favorite room. Stephanie, the homeowner, recently moved to a new state and wanted help with the finishing touches of her second floor. She is working on finishing several spaces and was on a tight budget, so we opted to focus on her two top-priority spaces. 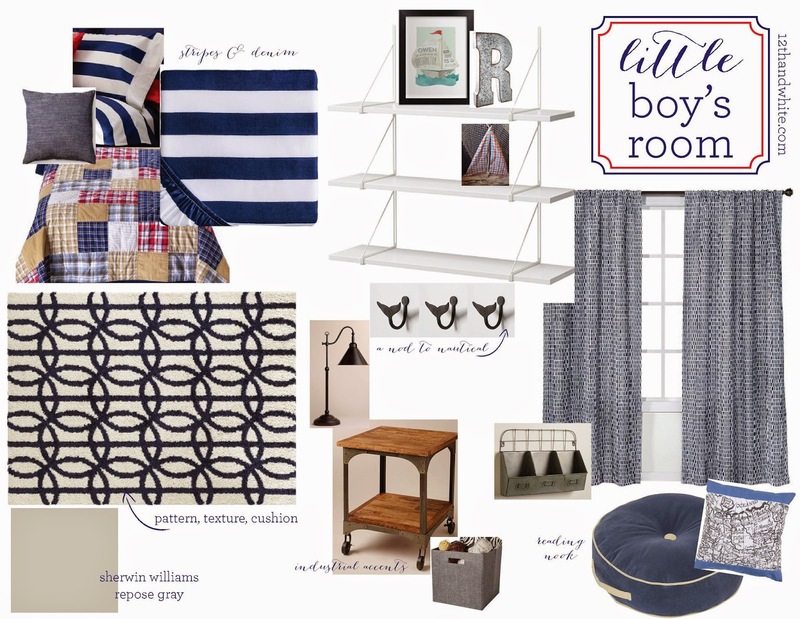 Ya'll know I'm all about watching the budget : ) Today I'm sharing our plan for her four-year-old son's room. Since we don't have kids, this was a fun one for me to be able to do. Here is the before picture of the space. She already had the furniture, but needed finishing touches to tie it all together. She had already chosen a nautical theme and navy, red and white as the colors, so we went from there. The layout needed to stay essentially the same for reasons of practicality, so we chose to inject color and interest into the room with fun accessories and textures. She's also planning on painting the bed black to tie in with the hutch and give a cohesive feel. I was hoping to achieve a Pottery Barn Kids look without the price tag. I wanted the room to feel pulled together and intentional but still very fun. 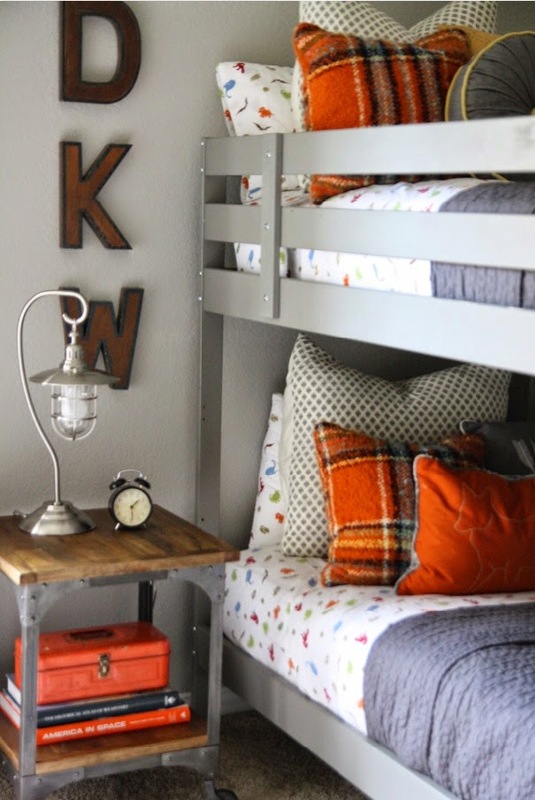 She already had the plaid bedding, and I suggested she pair it with a wide navy and white sheet set from Target, then make the bed like the photo below from Holly Mathis to show both patterns. I love mixing patterns like plaid and stripes to add layers to a look! Stephanie also requested open wall shelving, and I thought this shelving unit from IKEA fit the bill with its clean lines but industrial feel. I suggested she wrap the tension wires with jute or rope to add an extra nod to the nautical look. I also wanted to add a few items that could grow up with him, since kids change so fast. This side table goes great with a nautical little boy space, and can stick around for a more industrial pre-teen or teenage room. The lamp is classic enough to stay too. And I just loved these little whale tail hooks for a bit of subtle whimsy! Stephanie also wanted a cozy place for her son to play and read. Since it's a small space, I thought a little reading nook under the window with a floor cushion and a few pillows would be a fun hideout. The rug is soft and perfect for playing, but adds lots of texture and interest to the room. He can stash his favorite items and books in the metal wall pockets nearby. This was such a fun space to work on! I am just dying to see how Stephanie pulls it all together! I know it will be darling! 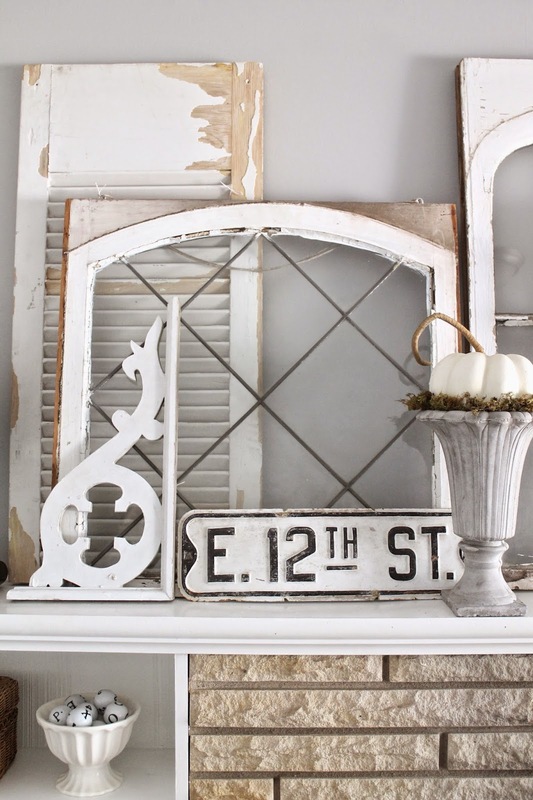 If you would like to learn more about 12th and White's decorating services, please go here. I get a lot of questions about finishing touches. 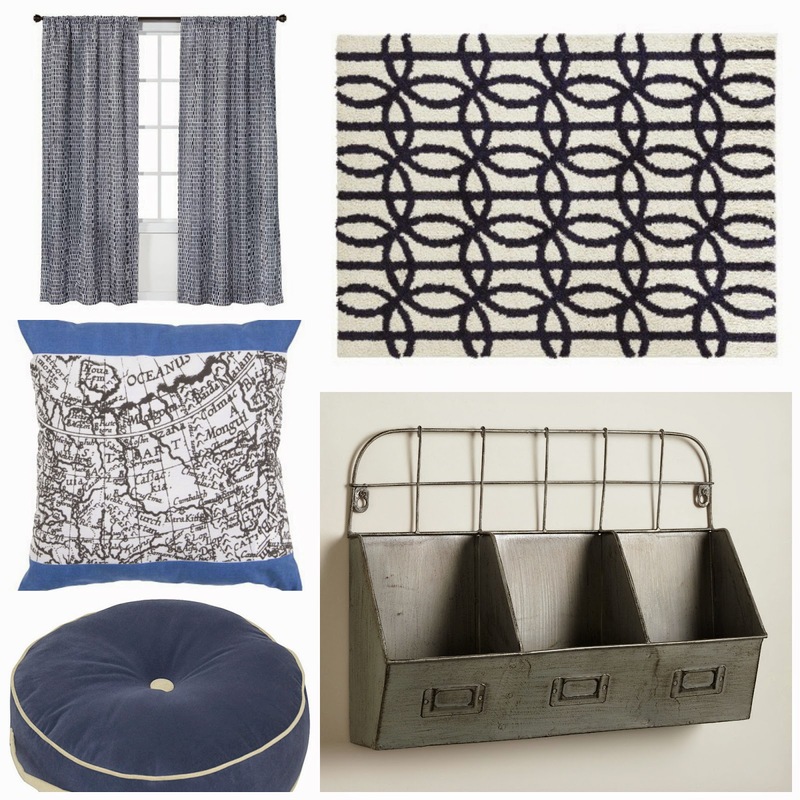 Things like accessorizing, filling a wall, styling shelves, etc. can be a challenge for all of us. It takes time, vision and creativity. 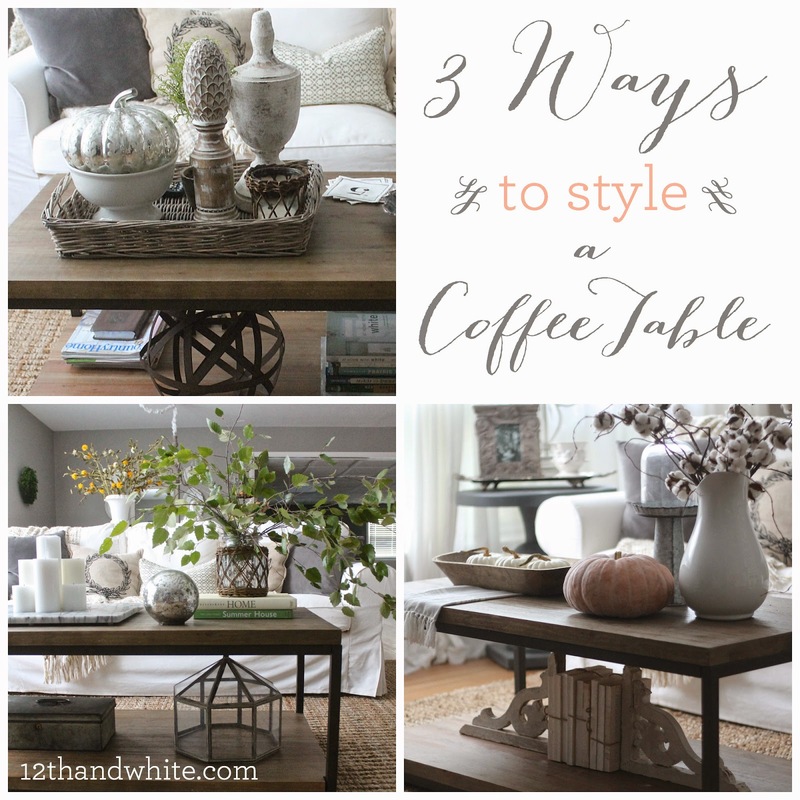 So today I thought I would show you three ways to style a coffee table, and some tips and tricks along the way. 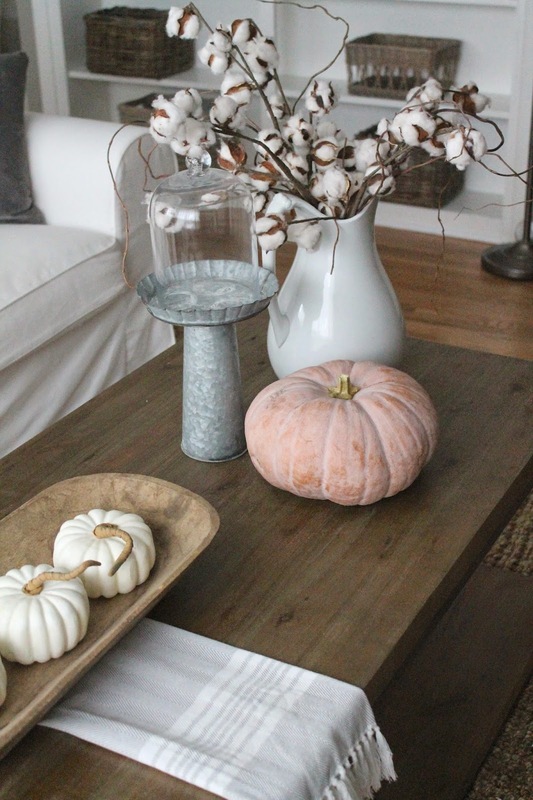 This is how our living room coffee table looks on a daily basis. 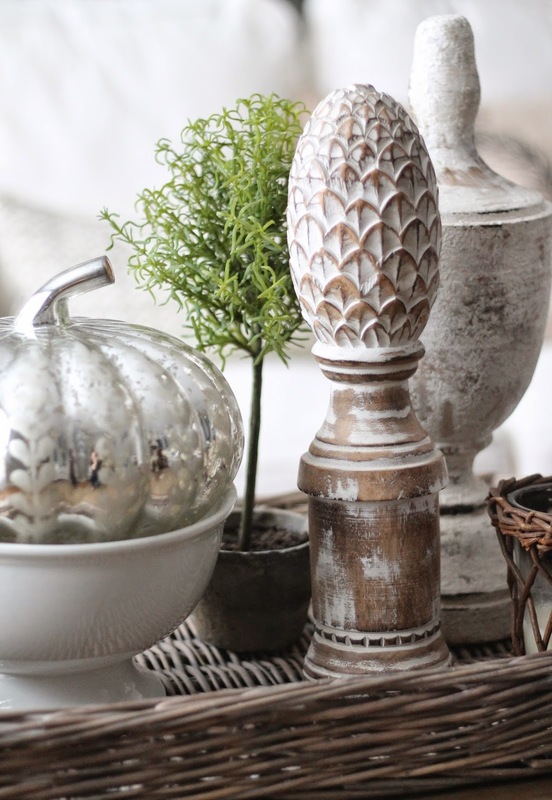 It has some of my very favorite accessories on it - a gray wicker tray, a few large finials, a great faux topiary, and a large orb, to name a few. The look is cohesive, casual enough for everyday, but still feels pulled together. The large tray groups all my objects so they feel cohesive and collected. 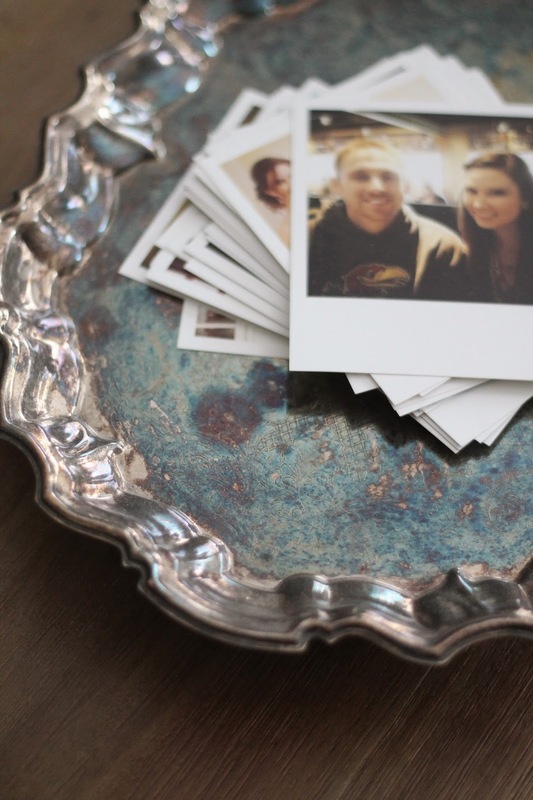 A smaller silver platter elevates a stack of photos to a place of prominence. 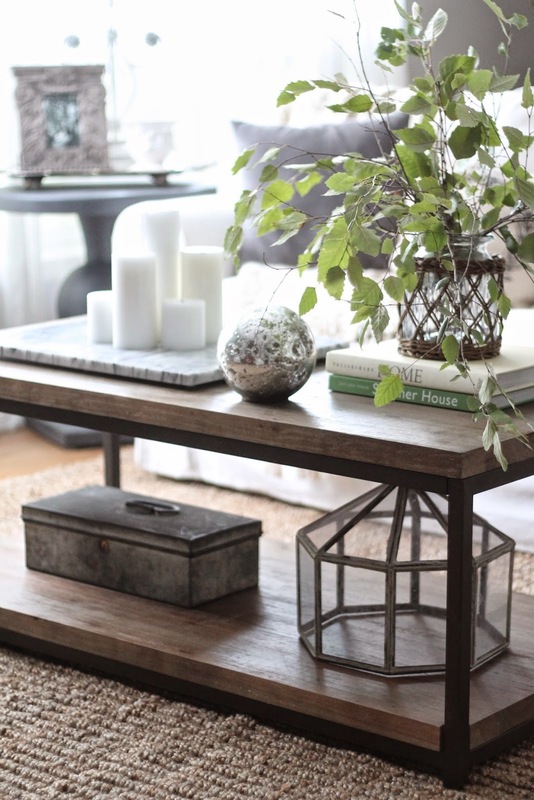 Each defines a section of the coffee table. In this case, I had a set of my favorite Instagram snaps printed by Origrami. Everyone loves to look through these at parties and showers! 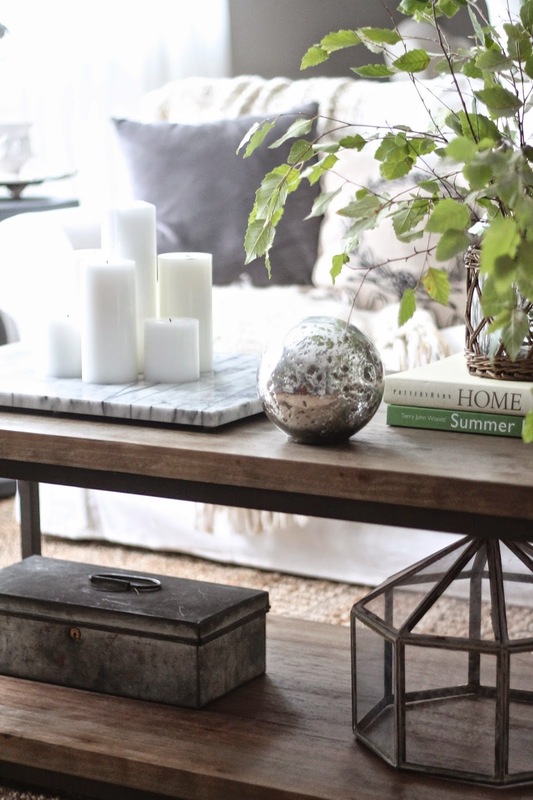 Coasters and coffee table books are staples for a reason. 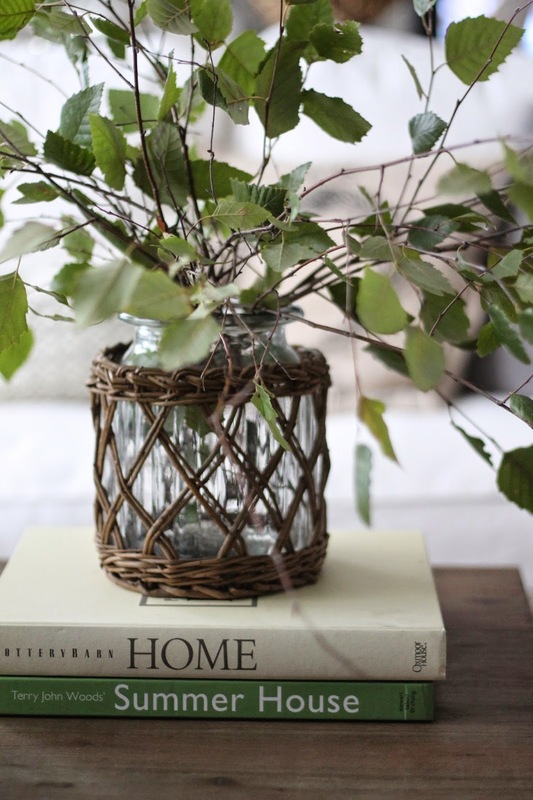 Give your guests an obvious (and pretty) place to set their drinks, plus an interesting book to flip through. This look was a fun one to style because it came together a tiny bit more modern than I usually go. None of the elements in and of themselves is terribly modern, but the overall look feels updated and fresh. A long rectangle, octagon, sphere and lattice pattern are all shapes seen here. They play off one another to give the look depth. 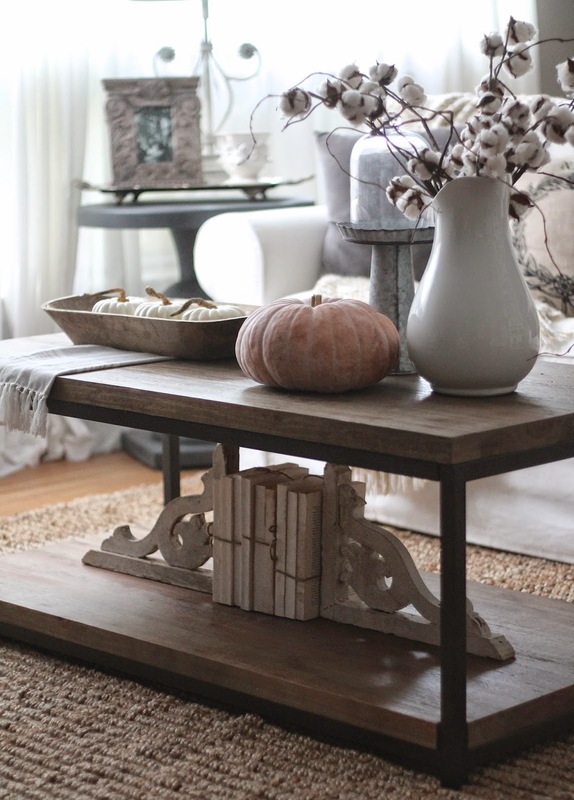 The varying heights of the objects also give dimension instead of leaving the decor feeling flat. Use books as risers to boost height if you need to. Here I simply trimmed branches from a tree in our yard for a pop of green and touch of nature. It gives the whole thing a more organic shape with the natural curve of the branches. In the world of textures, opposites usually work well together. 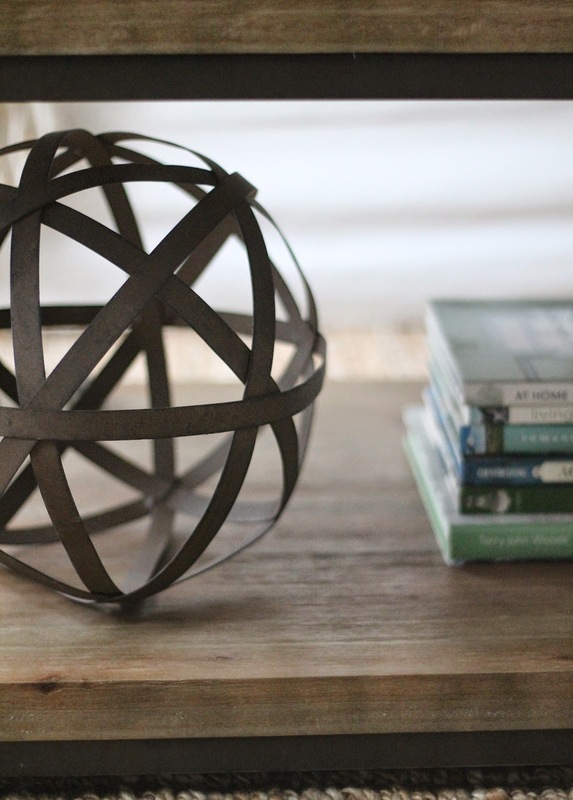 Here the shiny sphere plays well against the wicker to create interest. This look took me the longest to pull together but ended up being my favorite. 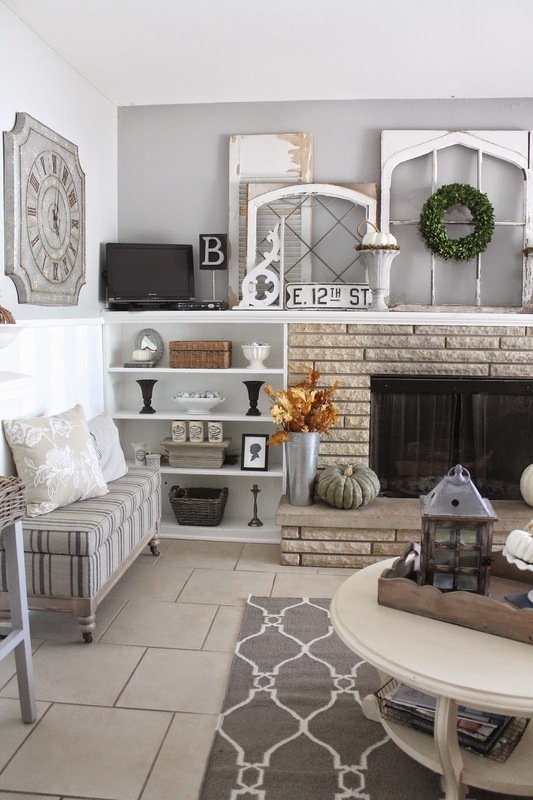 I had to pull lots of items from other rooms and vignettes, so it just shows it pays to think outside the box and shop your house! 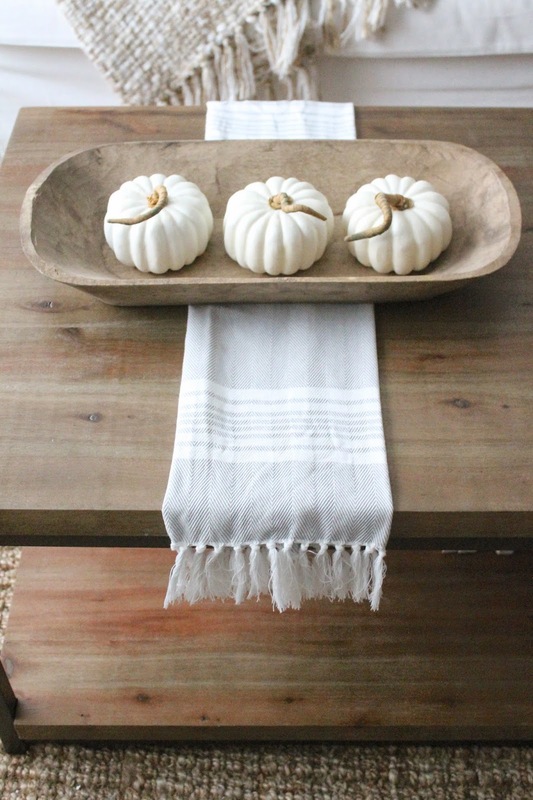 I felt the wood dough bowl needed some additional weight, so I grabbed a hand towel from the guest bath. It's an unexpected addition but adds visual weight, pattern and softens all the wood. The power of three in a vignette can't be beat. 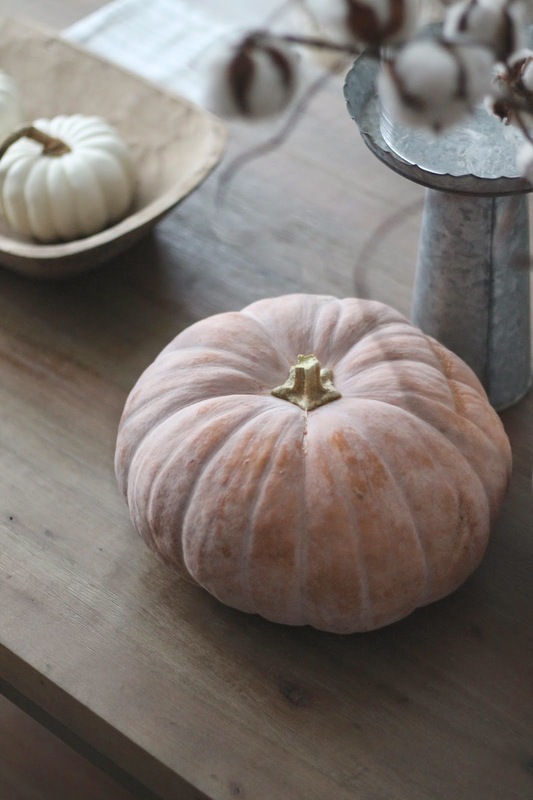 Here a pitcher, zinc cake stand and pumpkin combine together for the perfect fall farmhouse look. For some reason, I had the word "farmhouse" in my head for a third style. 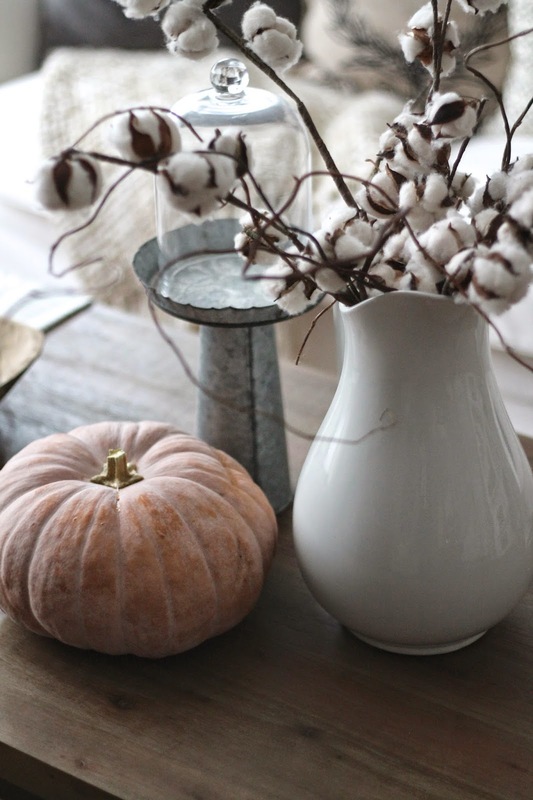 While my overall decor doesn't scream "farmhouse" I knew I could pull a few specific items that fit that category. 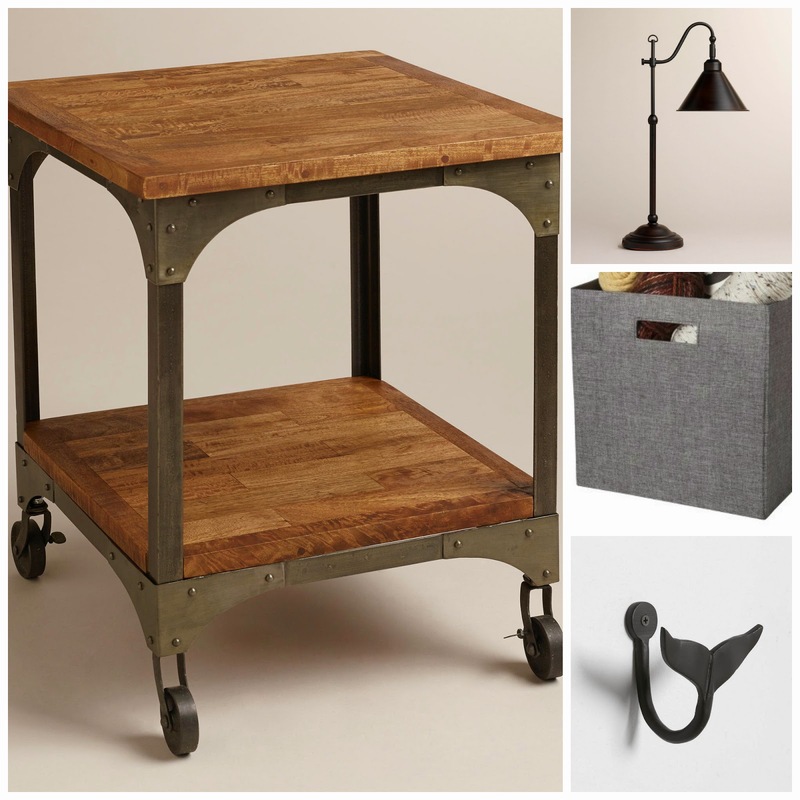 If you want to create a certain look like industrial, French, cottage, etc., choose only items that evoke that look on their own. When pulled together, they'll create quite a statement. 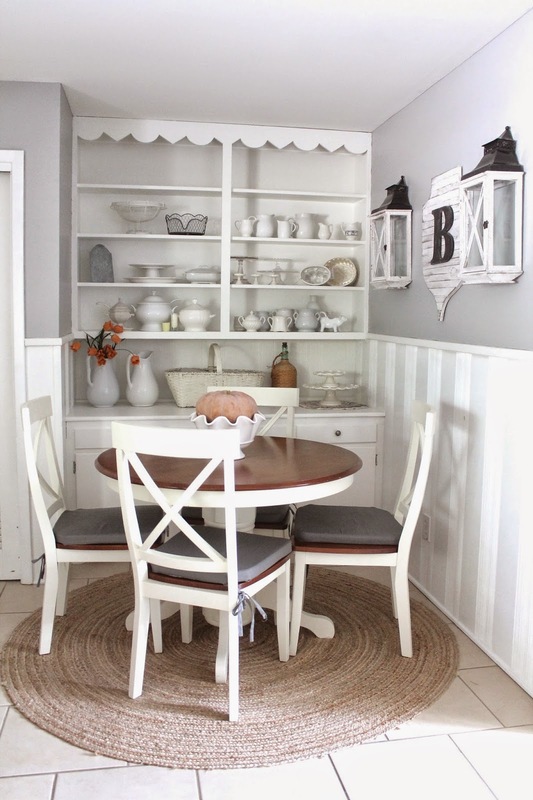 Use architectural salvage in unique ways, such as corbels as bookends or an old shutter as a tray. In this look, there really aren't that many objects used. Stick with unique objects that tell a story and you won't need much. 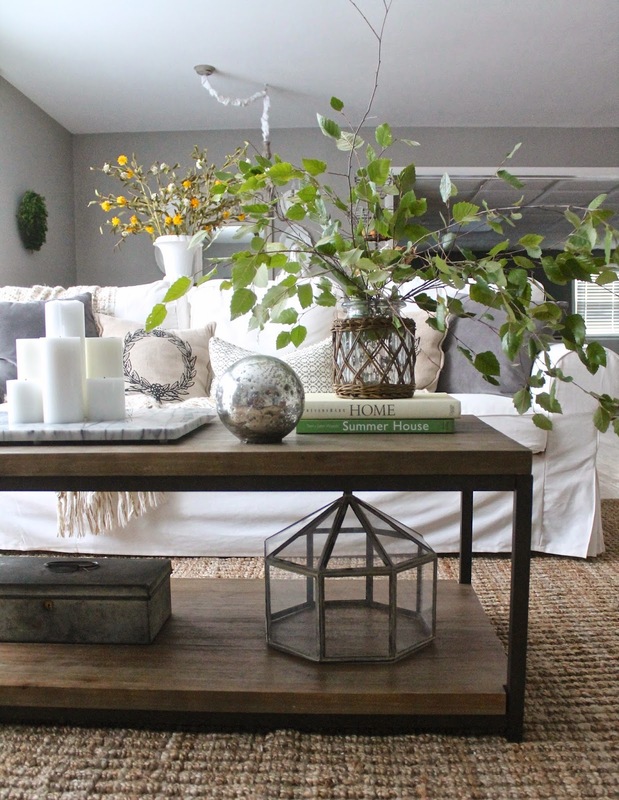 It was so much fun to get creative with what I had and style our living room in new ways! Hopefully it sparked an idea and gave new inspiration for you too! People often ask me if it's difficult to sell the things I find. Most of the time, it's really not. I always buy things with a purpose in mind - either to keep or sell. Occasionally, there is a really special piece I just can't let go of, even if it was meant to put a price tag on. 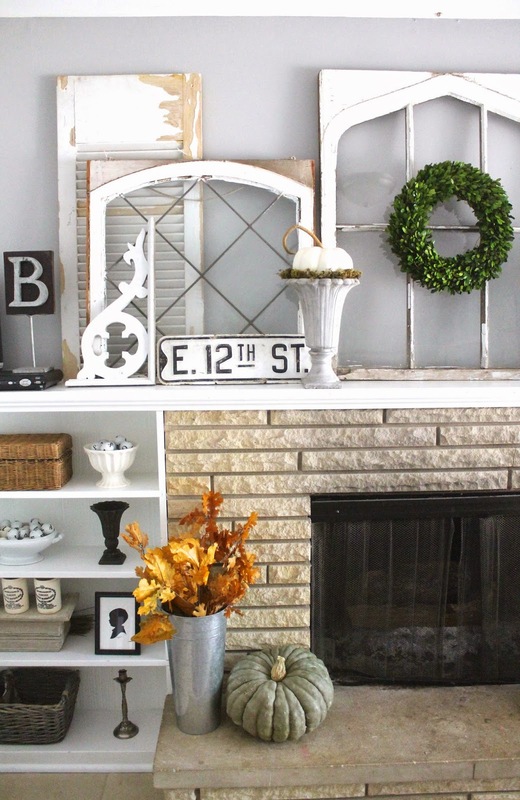 This was the case with an arched leaded glass window I found while in Kansas City a few weeks ago. I brought it in the house and "just wanted to see" what it might look like on the mantel with my other architectural salvage pieces...of course it was perfect. So for now, I'll be keeping it : ) I love the varied height it adds with my other large arched window. 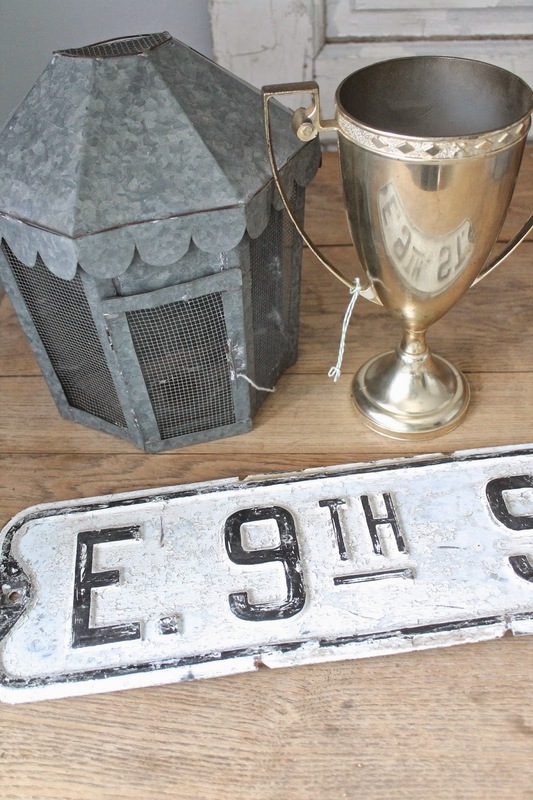 I also found a pair of the corbels you see here, and one of my favorite finds yet - the 12th Street sign! Since I changed my blog/business name I knew I wanted to find this sign - I just didn't know I'd find it so quickly! I was thrilled to have this special piece! I also recently found the perfect finishing touch to this wall in our little breakfast area. I got the large B plaque for Christmas last year, but always knew I needed more to finish off the wall. I found these hanging lanterns online and knew they would be such a fun addition. I think they are really unique pieces and love that they fit right into this corner! This room was always a bit of a "second thought" after our living/dining area, but I'm feeling like it's finally coming together!